Pratchett returns to the terra firma of his popular, sprawling Discworld series, the young-reader corner of which centers around teen witch Tiffany Aching. Being a good witch mostly means tending to the locals’ minor aches, pains, and kerfuffles—which she does with as much aplomb as anyone could be expected to muster—but to become a great witch, she’ll have to contend with the malevolent ghost of an ancient witch-burner. Yet even that might not be as terrifying as trying to keep the peace between the humans and the wee Nac Mac Feegles (whose primary skills are drinking, brawling, having Scottish brogues, brawling a bit more, and stealing every scene they’re in) and, shudder, getting wrapped up in the wedding of her childhood friend, who is suddenly a very myopic baron. 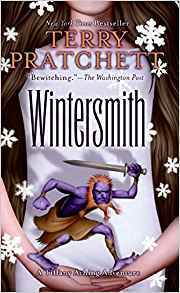 The action never picks up much more momentum than a determined amble, but readers won’t care a whit because in terms of pure humor per square word, Pratchett may be the cheeriest writer around. Now that Tiffany Aching’s adventures are concluded, readers can explore the nearly three decade’s worth of other Discworld books. Well, in all honesty, I can't say it better then the review from Booklist, so I'm not even going to try. The whole series was a delightful read. 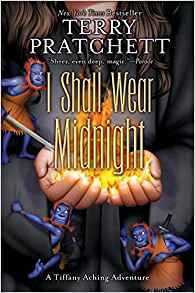 In this last Tiffany Aching,book Pratchett ties up some loose ends, and gives Tiffany yet another evil to fight while she grows into her witches shoes... or should I say her midnight dress? Many of the "usual witches" abound and a few new ones to boot. One can never have too many witches! And who is the new man in Tiffany's life? I would have liked to seen the Nac Mac Feegles a bit more because their dialogue is certainly fun to read, and they were in the book, I would have just liked to have seen them even more. For anyone who has not read any Discworld / Pratchett books this series would be an excellent start. I think next is a quick Winnie the Pooh read and then on to Tooth and Claw by Jo Walton. Grade 6 Up–Winter must die, and Summer must sink into the ground; it is all part of the Story, and Tiffany Aching has danced into the middle of it. On the last day of autumn, Tiffany travels to the woods to witness the Black Morris, the traditional dance of the gods heralding the arrival of winter. In a moment of heedless excitement, her rollicking feet draw her to the music, and she crashes headlong into the Wintersmith. He is fascinated by the girl and proceeds to court her in his own fashion–all the snowflakes are made in her image and giant Tiffany-shaped icebergs appear in the sea. Meanwhile, Tiffany begins to show characteristics of the goddess Summer–the touch of her bare feet makes things grow. All the attention from the Wintersmith would be quite flattering were it not for the deadly winter that threatens the shepherds of the Chalk. As the situation is very dangerous and death is certain, the Nac Mac Feegles (along with an especially lively cheese named Horace) are directly in the fray protecting their big wee hag along with Annagramma, Granny Weatherwax, Miss Tick, and other favorites from past adventures. All are skillfully characterized; even the Wintersmith elicits sympathy as he joyfully buries the world in snow in his attempt to win Tiffany. Replete with dry and intelligent humor, this latest in the series is sure to delight. This is book 3 of the series. It is a pretty quick read and is enjoyable. Once again Mr Pratchett brings together Nac Mac Feegles and witches and forms a love story (of sorts) around the very young Tiffany Aching. Who, by the way, turns 13 in this story. I still really like the Feegles, but they are used less in this book than the others. The older witches are used more to help Tiffany thru a time when none of them know exactly what will happen. The Wintersmith tries to become human so that he can marry Tiffany. (at least that makes him thoughtful). In some ways you even begin to feel sorry for him! But in the end the wee big hag shows that she is a true witch, much to the Feegles delight. This was an enjoyable read to this series (so far my favorite of them is book 2). There is one more book "I Shall Wear Midnight" which I will read next. Three out of Five books read for Once Upon a Time!